Did you see me? Well, not my face, but "VILLABARNES"? 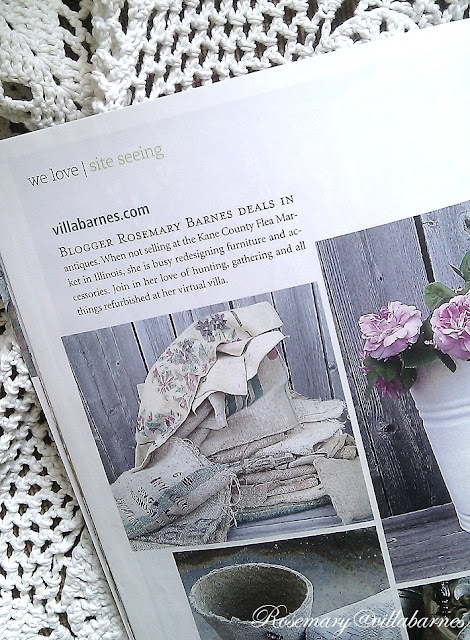 I'm in the September 2012 issue of Romantic Homes Magazine in the "Spanning the Blogs" section. A short while back, I was contacted by Beth Livesay, a contributing editor at Romantic Homes Magazine. She asked if it was okay to feature my blog. OKAY? Beth is such a sweetheart, and so easy to work with. I always enjoy looking to see if there is anyone I know featured, and I'm quite honored that she considered me. Many thanks to Beth, and everyone at Romantic Homes Magazine. Thanks to all my readers, as well. Your encouragement, support, and friendship keeps me going. I'm rather busy, getting ready for Kane County this weekend. Hope to see some of you there. Congratulations, Rosemary! I am thrilled for you. Well deserved, sweet friend! Congratulations! You deserve to be featured with all that you do. Can't wait to see that new issue too. Oh sweet Rosemary, if someone deserves to be featured in such pretigious and beautiful magazine is certanly YOU!! Congrats, I'm so happy for you! Have fun at the Kane County this weekend too. So nice Rosemary! Your blog is always filled with the loveliest posts and this feature is awesome! AWESOME. I'm buying a copy as soon as I can just 'cuz you're in there! I am so tickled for you.. This is a great honor and you certainly deserve it. Its wonderful they choose to acknowledge your beautiful work. WooHOO Rosemary!! How exciting! Oh I hope that magazine is waiting for me in my mailbox...I need a good magazine fix right now. I always look at the blogs featured too...so I'll be sure to know it's you! That's wonderful news, Rosemary! Congratulations! I'm so happy for you! That is a thrill and a half! Congratulations! I'll see if I can find a copy in my area. CONGRATULATIONS! How wonderful! Your blog is Fabulous, so I'm really not surprised, enjoy! Congratulations Rosemary!!! I'm so happy for you. I cant wait to get the magazine show it to everyone and tell them I "know you" LOL. This is really great news. Congrats Rosemary so well deserved you are such a beautiful talent out here in blogland. Can't wait to SEE IT!*!*! I'll be ShoPPing your Booth at Kane This Weekend - Bring Some SHaBBies for me!!! Congratulations Rosemary!!! You so well deserve it!! I'm so happy for you! Congratulations! How exciting to see you in Romantic Homes. Love your blog & your creations. I saw you! I saw you! : ) Congratulations, Rosemary! How exciting and well deserved. Aunt Rosemary, thats AWESOME! Congrats! A big congrats, Rosemary! My issue arrived today, and I was super excited to see you there! That's so awesome and well deserved! Congrats to you! That is absolutely fantastic. You so deserve this as your blog is lovely as are all your redos. Makes me feel like I'm smarter than the average by bear already following blogs who are shinning stars! Congratulations, Rosemary, for being featured in Romantic Homes. Not surprised because you have a fantastic blog and you are so talented! Yayness. I will look for that issue. Congrats Rosemary...soooo very happy for you. My issue arrived today and I was excited to see the mention of your blog. Living vicariously through my favorite blog! A big CONGRATS to you Rosemary, very well deserved. CONGRATS Rosemary! I'm so happy for you!! Yes, I saw! Congratulations on the feature! How happy was I to open my mailbox and find you there, Rosemary! I am so pleased and proud for you. I told you you needed to be in magazines. Now when is that book deal?! Wow that is fantastic!!! I will have to go get me a copy. Happy for you! Congratulations Rosemary. I am so happy for you. You definitely deserve this honor. I know you are busy please don't feel the need to respond back to this comment. Congratulations, Rosemary. Romantic Homes is one of my favority magazines. Congratulations Rosemary!! I haven't seen the latest issue yet, but I'll be watching for it. YAY!!! Finally! I knew it would happen eventually...but this is just the beginning! My issue always comes the last to my house of anyone in blogland...and sometimes never at all!! But when it does I will be thrilled to see you in the pages, I too like to see who is in the latest~last month it was NIta, and this month it is you! Well deserved!! That is so wonderful. Congratulations! Congrats, Rosemary. That is awesome. Awesome!! So exciting. Congratulations! You deserve it! I haven't gotten my copy yet, but I am not surprised. You are awesome!! Congrats! Haven't gotten it yet but am happy you are in it! You deserve it! Congrats!!! I'll have to buy the magazine. How exciting. 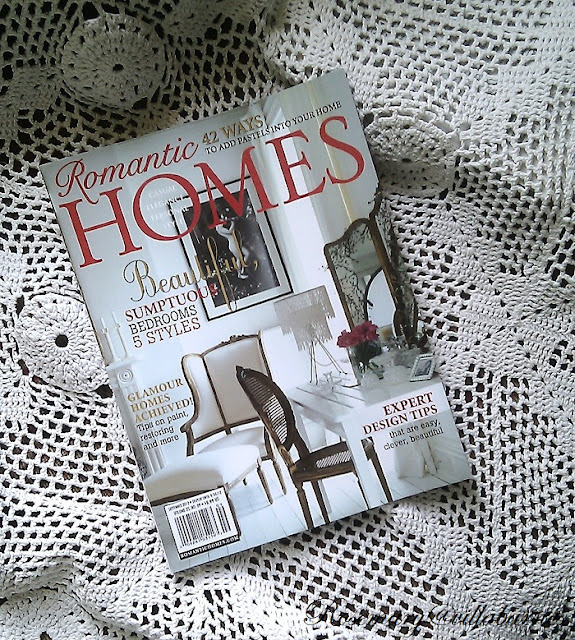 Romantic Homes is one of my all time favorite mags! You are very deserving - you are so talented and what is amazing is how willing you are to share your secrets with all of us. Hi RoseMary. I follow you in a while and I love your work. Congratulations, you deserve it. A hug from Barcelona. oh, how exciting! a big congrats to you, rosemary! Congrats Rosemary!!! I will pick up a copy! So happy for you, you do beautiful work! So glad you have been recognized! Congratulations Rosemary! These are some well earned Kudo's!!! Congratulations Rosemary! So well deserved. Your a wiz at beautiful makeovers. Rosemary, you are very deserving of the honor. Your blog and your creativity are both unique and beautiful! Congratulations. Rosemary, I'm so happy for you Congrats! You definitely deserve it! Congrats, Rosemary. Very deserving. I'll have to pick up a copy! Congratulations! You deserve this, Rosemary. You always have so many fabulous projects on the go. You know how to create truly beautiful treasures. congrats, rosemary. the feature looks great. I just popped over because Betsy at Coastal Colors mentioned your Gesso techniques, & I was curious. Well I did "Pin" that info, but I'm also a new follower because your blog looks so interesting. Congratulations, by the way, for your magazine feature. That is awesome! Congratulations, Rosemary! This is so wonderful and they couldn't have picked anyone more worthy! oh, you soooooo deserve this!!! congrats! Congrats Rosemary to a beautiful blog post in R/H magazine. I purchased my R/H at the market tonight and could not wait to get home and make mention I saw you featured. You belong in a big feature page after page. Have a beautiful Romantic Homes magazine featured month. Fabulous as always, congratulations..you are totally deserving! How wonderful! I'm going to have to buy this issue for sure! Congratulations. Congrats Rosemary!! !...what an honor that is so well deserved...Looking forward to getting the magazine! !